The pass also includes a couple of Resistance Mode unlocks. 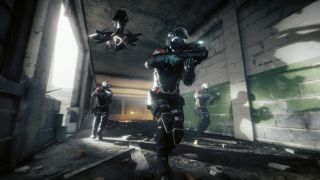 The Red Dawn-esque shooter Homefront: The Revolution is now out, and so is the “expansion pass,” which publisher Deep Silver said will include three “currently planned” single-player campaign DLCs, as well as a pair of exclusive bonuses for use in the online co-op Resistance Mode. The first two expansions, The Voice of Freedom and Aftermath, will add new districts and “several hours” of content on top of the roughly 30-hour base campaign. The third expansion, Beyond the Walls, will be much larger than the first two, and is slated to come out sometime in 2017. As for the Resistance Mode perks, “Supply Line” will grant expansion pass owners a free Resistance Crate each week (assuming they log into Resistance Mode), and “The Right Kind of School” unlocks three new starting backgrounds—ATF Agent, G-Man, and US Marshall—for Resistance Mode characters. Deep Silver also said that a new set of Resistance Mode missions will be released in June at no charge, as will all future Resistance Mode missions. I'm a little put off by the “currently planned” qualifier in the announcement, because I can't help thinking that “unless things go completely sideways, in which case all bets are off” is being left unsaid. I've reached out to Deep Silver for clarification on that point, and I'll let you know what they say. The Homefront: The Revolution expansion pass is available now, in North America, for $25. Those of you in the rest of the world have to wait a couple more days for the fun to begin: Homefront: The Revolution, and the expansion pass, won't go live in other regions until May 20. Our review is up here, and we've also got the lowdown on what you need to know before you start playing.